Thermaltake loves to present new designs that make everyone just ooh and aah. Well, they have done it again. The Thermaltake Tsunami VA3000BNA is a gorgeous all aluminum case. Thermaltake finished this case with a brilliant mirror coating to impress everyone even more. This case comes with 2 installed fans. One 120mm in the front and one 120mm fan in the rear. In the multimedia panel are dual USB ports, audio ports, and a IEEE 1394 Firewire port. There are 11 drive bays including four 5.25' bays, two external 3.5' bays, and 5 internal 3.5' bays. 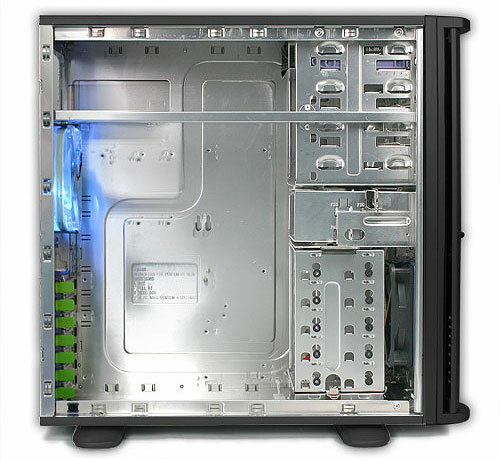 There are also 7 expansion slots and this case can support Micro ATX, ATX, and Full ATX motherboards. Also included is a lockable safety side-panel, retractable foot stand, a dust cloth for the mirror coating, and patented sliding rails designed for easy 5.25' device installation. The dimensions of this case are 495 x 210x 478 mm, and since it is all aluminum, it is quite light as well. So when your mom asks why your room is such a mess, don't blame it on Willy the dog... blame it on a Tsunami. The Thermaltake Tsunami.